Dae-Ho Lee, the 33-year-old rookie from South Korea, has shown enough in spring training to win a platoon DH job ahead of Jesus Montero, who likely will be cut Monday. With the first game about a week away, the Mariners began more serious roster work Sunday with news that South Korean import Dae-Ho Lee was moved onto the major league 40-man roster, meaning that he has won the platoon DH spot against lefthanders, and 1B Jesus Montero’s Seattle career is likely over. On the field Sunday, Robinson Cano went 4-for-4 with four runs scored, three home runs, seven RBI and one walk as the Mariners defeated the Chicago Cubs, 12-9, before a crowd of 15,438 at Sloan Park. During a seven-game hitting streak, Cano is batting .478 (11×23) with six runs scored, two doubles, a triple, four homers and 11 RBI. James Paxton allowed seven runs on nine hits in four innings with three walks and no strikeouts, raising his spring earned run average to 10.80, damaging his chance to remain in Seattle as the fifth starter ahead of Nathan Karns. In another personnel decision, GM Jerry Dipoto said Joel Peralta, the 40-year-old reliever hired away from the Dodgers in February, would make the 25-man roster sometime soon. No word was official on Montero, whose locker at Peoria Stadium was emptied Saturday. Manager Scott Servais told reporters before the Sunday that Montero “was with his family.” Sunday afternoon, Jon Heyman of MLB Network tweeted that Montero had been waived. 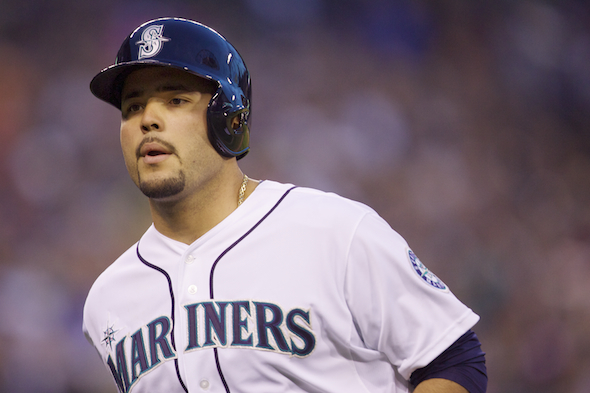 The Mariners are likely waiting for a 48-hour waiver window to close before designating him for assignment. Montero is out of minor-league options. If he clears waivers, he could be assigned to Tacoma. Dipoto told reporters that Lee, a 33-year-old who dropped 40 pounds in order to make the transition from Japanese baseball, where he hit 31 home runs the past season, had made believers of the Mariners bosses. “He has a history of hitting left-handers and I think he has given us reason to believe in spring training,” Dipoto said. “He’s very prepared, very calm in the batter’s box. He’s gotten better every step of the way as we’ve gone along. Lee, who will earn $1 million if he makes the opening day roster and up to $4 million with incentives, entered Sunday’s game against the Cubs hitting .250 with one home run in 40 at-bats. Montero hit .237 with no homers. Peralta with the Dodgers last season was 3-1 with a 4.34 ERA in 33 games with three saves, and also had injuries to his neck and shoulder. “Joel is a gamer,’’ Dipoto said. “He makes a difference in our club. I think Joel is a leader in the bullpen and physically he’s been 90, 92 (miles per our) this whole spring. His split-finger is a weapon. He’s a guy that gets the righties and the lefties out out. Furbush, one of the few holdovers from last season’s bullpen, is unlikely to be ready for the opener because of shoulder problems. Dipoto said Furbush is undergoing a “medical procedure” that was not surgery to relieve some discomfort. He has thrown only batting practice this spring after rehabbing a partially torn rotator cuff. The Mariners assigned two righthanded pitchers, Casey Coleman and Justin De Fratus, to the minor league camp, and another one, Joe Wieland, to AAA Tacoma. Also going to Tacoma was OF Shawn O’Malley . . . Saturday, SS Ketel Marte went 2-for-3 with two runs scored, a double, an inside-the-park home run and an RBI. In his five games prior to Sunday, he has a hit in each, going .429 (6×14) with seven runs, two doubles, a triple, a home run and two RBI scoring two runs in each of his last three games . . . OF Seth Smith has hit safely in six consecutive games before Sunday and 11 of his 13 games this spring. Over the past six, Smith is batting .588 (10×17) with three runs scored, two doubles, two triples, a home run and seven RBI…Smith has three multi-hit games in a row and seven overall this spring . . . the Mariners prior to Sunday hit as a team .286 with 159 runs, 56 doubles, 14 triples, 29 home runs, 153 RBI and a .344 on-base percentage in 27 games. The average is sixth in MLB behind Arizona (.325), Los Angeles-AL (.312), Texas (.310), Washington (.289) and San Francisco (.289). I was rooting for Dae-Ho Lee right from the start. He’s a wonderfully interesting story and the Montero story had ceased to be all that interesting. I’m glad Jesus was able to make the changes in his life that he wanted to make at the very least, whatever happens with baseball. Now let’s see what “Big Boy” can do. two days ago new Mc.Laren. F1 bought after earning 18,512$,,,this was my previous month’s paycheck ,and-a little over, 17k$ Last month ..3-5 h/r of work a days ..with extra open doors & weekly. paychecks.. it’s realy the easiest work I have ever Do.. I Joined This 7 months ago and now making over 87$, p/h.Learn. More right Hereo!225➤➤➤➤➤ http://GlobalSuperEmploymentVacanciesReportsMedia/GetPaid/98$hourly…. .❖:❦:❖:❦:❖:❦:❖:❦:❖:❦:❖:❦:❖:❦:❖:❦:❖:❦:❖:❦:❖:❦:❖:❦:❖:❦:❖:❦:❖:❦:❖:❦:❖:❦:❖:❦:❖:❦:❖:❦:::::o!225………….